Why was the first Arsenal side called Dial Square and why did it only last one game? Imagine yourself to have been working in a factory complex whose grounds covered over 1000 acres, and which employed around 70,000 people. The year is 1886 and you are working in an era when the game of football was already well known and well established. Indeed the oldest football competition – the FA Cup – was already 14 years old, having been created and originally played just ten miles away from the homes of the men who worked in that factory complex. In such circumstances you might well want to set up a club of your own, and this would mean dealing with a few basic pre-requisites. For a start you would need a large open space on which a game of football could be played: for the men (and women let us not forget, for women’s football flourished in the early days until it was outlawed by the appalling FA in 1921) who worked in those 1000 acres of factory, Plumstead Common and the fields on Plumstead Marshes offered a perfect place to play. You would of course also need a team, and that surely would cause no problem. Indeed you could probably recruit just such a team from one of the individual factories that made up the Royal Arsenal. All you’d need after that would be some opponents. a) Gather together not 11 players, but 22 players, and on the day of the match divide them into two teams, perhaps with the captains picking their teams from the assembled throng in the time honoured manner still used by school children. b) Meet up with the leaders of another team that already exists nearby and offer them a game in the local park. c) Travel to a more distant location to play a team from a different locale which already had a pitch to play on, and an established team playing at a reputedly higher level. Now the curious thing is that upon being founded in 1886, the club that became Arsenal seems to have ignored the most simple option (a) despite the size of the workforce in the armaments factories, and also ignored the almost as simple option (b) despite the existence of other clubs in the area, and places to play games. Instead the players in their newly formed club chose the much more complex and convoluted option (c). Indeed they chose to make a journey of around seven miles, which included a crossing of the Thames, to play a team with which they had no connection. It’s a subject we have explored at length on this site, and which resulted in Andy Kelly’s wonderful discovery of the advert in “The Referee” magazine by Eastern Wanderers asking for teams that they could play on specific dates. For a while, before the discovery of this advert, and the discovery of the subsequent reporting of the score (although no details of the game) in the press, this decision to travel across the Thames to play Eastern Wanderers seemed rather strange, given that the founders of Arsenal did this in the depths of winter when the journey would have been harder, the light more prone to dropping below the necessary level before the end of the 90 minutes and the pitch conditions being even more uncertain. So why did the men who formed the club called Dial Square in 1886 go for option c) (playing a team on the other side of the Thames) instead of the much easier options a) (dividing into two teams and playing each other) and b) (playing against another much more local team). To understand what happened we need to recognise that the Royal Arsenal, Woolwich, was not a unified employer, it was organised as a huge and complex array of separate departments which manufactured armaments, ammunition, organised proofing (to make sure the weapons worked as intended) and constant research into explosives. Each of these factories operated almost as a separate entity and employee’s loyalty was to their factory, not to Royal Arsenal, just as many servicemen have loyalty to their regiment before their sworn loyalty to their service. The site on the south bank of the Thames had started as little more than a storehouse for explosives in the 17th century, safely away from the highly populated areas of the growing city and close to the moorings the ships could use if needed for war. To this was added the Royal Laboratory for the manufacture of gunpowder, shell cases, fuses and cartridges. In the 18th century the Royal Brass Foundry was set up after the privately owned foundry that had been used, blew up. The state was learning about the benefits of state ownership of essential manufacturing! Next came The Carriage Works, for the building of gun carriages. Only in 1805 were all of these separate operations given a singular cohesive name: Royal Arsenal. But workers can be very conservative, and each factory remained very much a separate operation, each with their own expertise, its own management, its own tradition and its own history. To all these separate organisations were added the Royal Regiment of Artillery, the Corps of Engineers and the Royal Military Academy. All part of the Royal Arsenal, and yet still set up as separate bodies. Now in the midst of all this development, between 1717 and 1720 a further complex was added to which completed guns were taken to be finished and stored. There were two warehouses (one for the army and one for the navy), and beside them were the workshops where work was done. This group of warehouses and workshops was called Dial Square, and this is what “Dial Square” did – it finished and stored the guns. Thus each department of the Royal Arsenal was separate. Men and women worked for their section not for Royal Arsenal. A man in the Royal Regiment of Artillery was simply that – a member of the Royal Regiment of Artillery, not an employee of Royal Arsenal. And likewise, although less esteemed and well known, the work force in Dial Square worked for Dial Square, not the Royal Arsenal. Now it is more than likely that several sections of the Royal Arsenal built on the south bank of the Thames around Woolwich had football teams, and these teams probably did use method a) or b) outlined above for playing games. That is to say they either set up two teams from within their own department to play each other, or they played one department against another on Plumstead Common. We have no record of this – because there was no need to create one. Matches would have been arranged between workmates. Any written notes would have been on scraps of paper, nothing more. Rather like friendly five-a-side teams that play once a week today outside of any league. Word of mouth is all your need. But one complex within Royal Arsenal was different. Dial Square stood out from the rest in this situation because it had within it, by chance or because it had a name for it, a collection of men who were more than just football enthusiasts. They had already played the game for “proper” clubs. Let’s imagine the situation. Supposing you had played football for one of the recognised clubs in the land that regularly participated in the FA Cup in front of crowds of some size (remembering that by the time Arsenal played their first game in 1886 crowds of over 10,000 had been experienced across the country). You would probably want to play for something more than a scratch team of friends who just saw who was there on a saturday afternoon, divided into two teams, and had a kick around for a couple of hours. That’s fanciful I know, but one of the many things those in charge of Royal Arsenal needed to do was to keep the workforce happy. The last thing any 19th century employer wanted was an upturn in workers’ demands for more pay and strikes were becoming a major part of British life by the time Dial Square was formed. Trades unions were decriminalised in 1867 and their subsequent growth was rapid. I am not sure if all employees of Royal Arsenal were considered part of the military and thus still banned from forming a union, but I think not. So the “bread and circus” approach would have arisen. Pay the staff enough to keep them happy, and find them something to do in their spare time. So the experienced players of Dial Square found themselves together, looking for someone to play. If the notion above that recruits to the Royal Arsenal did indeed get focussed into Dial Square, that would not only have made Dial Square stronger, but the rest of the departments weaker when it came to football. And thus it was the division of Royal Arsenal into departments each of which had their own identity, and the fact that Dial Square had a collection of more experienced players in its midst (or perhaps attracted more experienced players as men drifted into Royal Arsenal looking for work) that led to the notion of not playing a local match, but of finding a club nearby that was already established and which would give these more experienced players a better game. Dial Square men saw themselves as proper footballers, and so went looking in The Referee magazine to find themselves an established team to play. The game against Eastern Wanderers was the result. And yet Dial Square FC only lasted for one game (or at least only one game we know of). As we have seen in other articles on this site, in the aftermath of the first match against Eastern Wanderers, the team, previously called Dial Square and almost certainly restricted to members of the Dial Square factory, was opened up to everyone who worked for Royal Arsenal. Indeed when a committee was elected to represent the newly enlarged team, although Dial Square was strongly represented, the Gun Shop also gained several seats on that committee, including one for the post of Vice Chair. Now this gives us a real insight into what was happening. The Gun Shop was in fact originally the Brass Foundry,which had been renamed the Royal Gun Factory, which was rehoused in large steam-driven workshops for production of modern iron cannons… next to Dial Square. Which now gives us the question – why didn’t Dial Square play the Gun Shop for their first match? I think the answer has to be in the fact that in all walks of life there are a fewer “doers” and a large number of “hey what we ought to do is…” people. The people who talk a lot but never actually get things organised. I know there’s a huge amount of supposition here, of course, but at least it offers an explanation as to why the Dial Square team travelled to the Isle of Dogs for the first game, rather than playing the Gun Shop on Plumstead Common. Of course such a match might have happened – as I said above, no record of such a match would have been kept. And we might even theorise that Dial Square won very easily, and through this realised that they needed to look further afield to find better quality teams to play, and so, for one match left The Gun Shop players to their own devices and went off to play Eastern Wanderers. I doubt that we will ever know, but such theorising does give us as clue as to what might have happened. Indeed if I may conclude with a moment’s pomposity, it was my insistence that the game against Eastern Wanderers didn’t happen as recorded (for all sorts of reasons that you can find if you read through the early articles on the subject) that led to the search of the press and the discovery of the adverts of Eastern Wanderers for teams to play, and the announcement of the result in December 1886. So why the change of name from Dial Square to Royal Arsenal? I am not sure that would have worked so well with men who were proud of their factory and wanted to uphold its name. But there clearly was a move to expand and develop the club that had played Eastern Wanderers, perhaps introducing a reserve team etc. And there was pressure from men who were in other factories to join the elite team of Dial Square. So one way or another the proposal was put to open Dial Square FC to everyone who worked in the armaments factories in Plumstead, and it was passed – which then meant that the club had to change its name. Since it was now opened to everyone who worked in the Royal Arsenal, Royal Arsenal must have seemed the right and obvious choice. There’s a broader index to various series of articles on the Society’s home page. And the full anniversaries index can be found here. 7 comments to Why was the first Arsenal side called Dial Square and why did it only last one game? Wonderful article Tony. A great history lesson of the Royal Arsenal and all your theories seem very feasible. We will never know for sure but being able to surmise is what makes so interesting. A proud if difficult start for our beloved club. 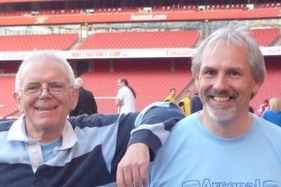 My grandfather was a blacksmith at The Royal Arsenal but he died when I was 6 years old so I can’t really remember any stories he may have told me but he certainly started a family support for the club which now spans 5 generations. During the first world war he had to melt down all sorts of scrap iron for re-use mainly railings and gates from the royal parks and then set up a smithy in Kentish Town after the war where his first contracts were replacing them , only for them to come down again during the second. Too much of speculation here. Lojot Rao That’s what historians do when there are only partial facts to go on. Tony , next time I need some facts on the Arsenal , remind me to check it out here first and not in wikipedia ! I could have used so much from here ! Tony, Joseph Smith was my Great-Uncle, one of the Dial Sq Fc organisers. My Aunt (his daughter in law ) is still alive, although his son( my Uncle died not so long back), she might have some photos. My Mother met him to. My Aunt has been quizzed, and seemed to think he was also involved with the kit somehow a bit later(from Forest?). His name does pop up in various articles.